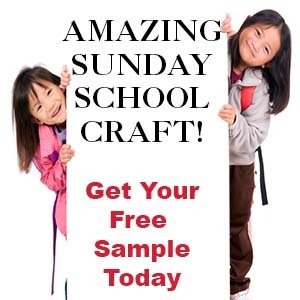 The following crafts and activities come from the Bible lesson for children "You Are Important! - The Body of Christ" on The Resource Room. Make a "God Made Me Just the Way He Wanted Me to Be" Booklet"
2. Cut the inside pages apart. 3. Cut the cover pattern in half and fold the top and bottom half to make the back and front cover. 4. Staple the book together. 5. In class read the book to the children and have them finish the sentences. If you have very young children, fill in the answers for the children. Copyright 2000-2017, Digital by Design, Inc.
2. In class have your children color the patterns and cut them out. 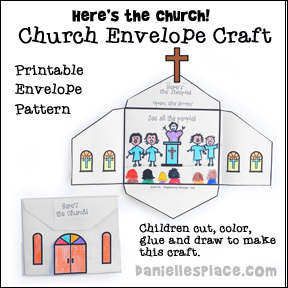 Have your children draw pictures of the people in your church on the inside of the envelope. 3. Glue the cross to the inside, top of the envelope. Fold the cross down on the dotted lines and fold the envelope up. 4. Glue the door, windows and "Here's the church" words on the outside of the envelope. Make sure your children only glue one side of the door to the outside so that they can open the envelop completely without ripping the envelope. Talk to the children about the importance of attending church regularly and belonging to a church family. Tell them that we often think of the church as a building, but the church is actually those who believe in Christ. 2. 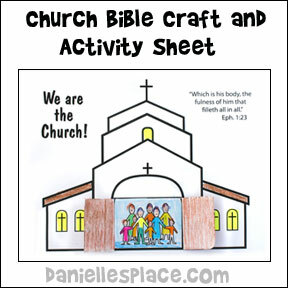 In class have your children color the church and door pictures. 3. Cut the thick center line of the door pattern and the tops of the door just to the outline. Fold the doors open and glue the sides and top arch to the church pattern. 2. In class have your children study the picture and try to determine what each cartoon character is doing to serve the church. Then ask them if they can name some of the people in your church and what they do in service for the church. Have them write the names and what they do on the back of the sheet. 3. 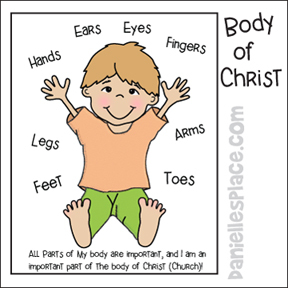 Discuss with your students what they can do in their part of the body of Christ. Before class draw puzzle shapes on a piece of poster board so that they make one big puzzle. Make a large center puzzle shape and write, "We Are all Important to God" on it. Cut apart all the pieces and staple the centerpiece to your bulletin board. As the children arrive give them a puzzle piece and have them write their names on it and color it. When they have finished, help them find how their piece fits into all the other pieces. Talk about how important it is to have all the pieces to a puzzle. The puzzle doesn't look good when their is a piece missing. 2. In class have your children color the picture. As they work talk about each part of the body and discuss how each part is important. Have them image what it would be like if one part was missing. 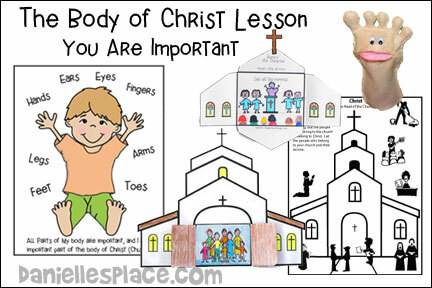 Ask you children how they can use each part to glorify God. Ask them how they can use their hands, feet, ears, eyes, etc. to help others and tell others about Jesus. Here are some words that do not describe body parts: Destestable, contemptible, expendable, dispensable. See if your children know what each word means. Emphesis that just as with our physical bodies, all parts of the body of Christ are indispensable, incredible and important. When you have finished ask the children: "Aren't you glad you have feet, hands, legs, arms, and shoulders? Aren't you glad God made us all different? Remember he made you just the way he wanted you to be". Give each child a piece of paper and have them write their names at the top. Tell the children that they will be drawing people, but that the whole class will be helping them to draw their picture. They can start with any part of the body they would like but they can only draw one shape on their paper then they have to pass it to the left. Then they will draw another shape to make a body on the paper that was passed to them. When they get their papers back, they can finish their own pictures. Sing "If You Are Happy and You Know It"
If you're happy, and you know it, clap your hands! 2. Use the feet patterns to cut feet from construction paper. Cut the eyes apart and cut them out if your children aren't very good at cutting. 3. In class show the children how to fold down the two bottom corners of the bag about one inch and tape them down. Have the children glue the toe part of the foot on the bottom of the bag so that the straight part lines up with the fold of the bag. Have them glue the heel part of the foot on the top of the bag so that the straight edge lines up with the straight edge of the toe pattern. They can also draw on eyes or glue the ones you cut out and draw on a mouth and nose. 2. Cut the mouth from pink felt. Cut the slit in the front of the puppet for the mouth. Mark the center of the slit on the puppet on the top and bottom of the slit. Mark the center and sides of the mouth on the felt puppet. 2. Make the mouth first. To make the mouth, working from the back side of the front foot pattern, glue one side of the mouth at the center to the top center mark on the slit. Place glue along the edge of one side of the top slit and press the mouth piece along the curve down onto the glue. The side of the mouth should match up with the end of the slit. Do the same for the other side. Fold the mouth in half and glue the other center mark on the mouth to the center of the bottom slit. Place a line of glue on one side along the bottom slit and press the curved side of the mouth down into the glue. Do the same for the other. The mouth should be in place. 3. Glue the puppet together. 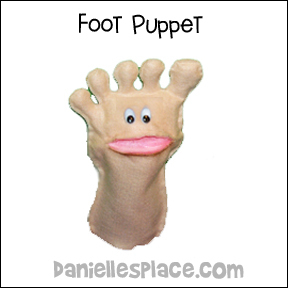 Start by gluing the toes, wrong sides together, (glue along the inside of the puppet) along the edges about one inch at a time, waiting for the glue to set before gluing another one inch section. Stuff the toes with fiberfill. 4. Glue the sides of the puppet together to finish. Glue on wiggly eyes. I just finished the lesson "You Are Important". We made the book and did the wall puzzle. 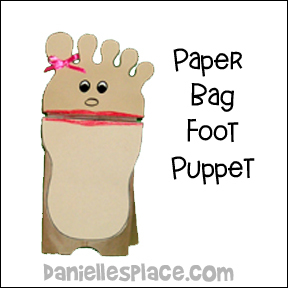 The hit of the lesson for my class was the foot bag puppet and the felt foot puppet. We talked back and forth with one another using our puppets. The kids loved talking to my puppet.